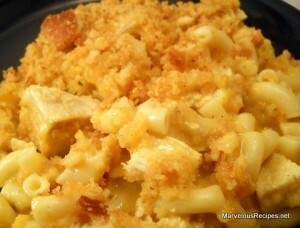 I asked my Buzz buddies for a recipe for macaroni and cheese, and received many wonderful returns. I subsequently tried an amalgamation of what was offered, and the results were pretty darn good. It's no IKEA mac and cheese, but it will most certainly do. Starting with Rugger Ducky's base recipe, with tips and additions from Amelia S, Stephen Allen, Deacon Frost, Paul Was and Philena Rush! 1. Boil one box of elbow macaroni until almost tender. Drain and set aside in large baking dish. 2. In a sauce pan, melt butter, add minced garlic, brown lightly. 3. Add salt and pepper and lower temperature. 4. Whisking steadily, add flour and mix thoroughly. 5. Add evaporated milk, continue mixing until smooth. 6. Blend in sour cream (and mustard). 7. Slowly add cheese. Continue whisking until smooth. Remove from heat. 8. Add sauce to pasta and mix well. Add meat. 9. Topping: Melt butter and remove from heat. Add bread crumbs and cheese and stir. Spread over top. 10. Bake at 350 degrees for about 15 minutes, or until the top is brown and bubbly.